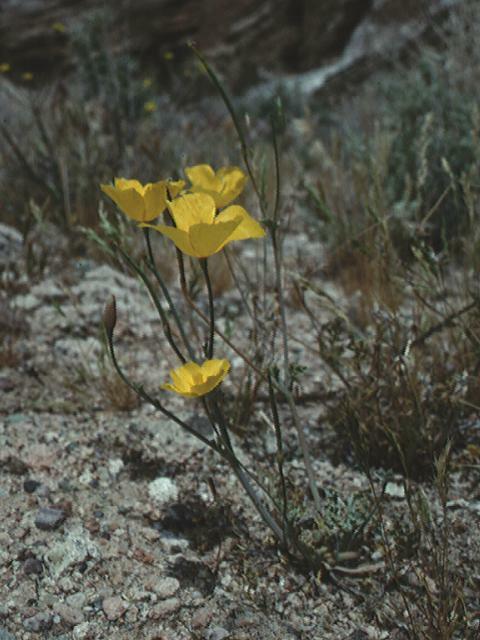 Eschscholzia minutiflora constitutes an autopolyploid series: it contains plants having, in this case, double and triple the basic chromosome number. The different chromosome levels differ somewhat in appearance, and are assigned to different subspecies. Subspecies twisselmannii has the basic diploid chromosome number of n=6, and is similar in general appearance to E. parishii (with which it was until recently confused). Tetraploids (plants with n=12, twice the basic number) are placed in ssp. covillei, and hexaploids (n=18) in ssp. minutiflora, shown here (Lewis and Snow, 1951; Mosquin, 1961; Clark and Faull, 1989, 1991). At the higher chromosome numbers, the flowers are progressively smaller and more likely to self-pollinate, so that in ssp. minutiflora self-pollination is the rule. 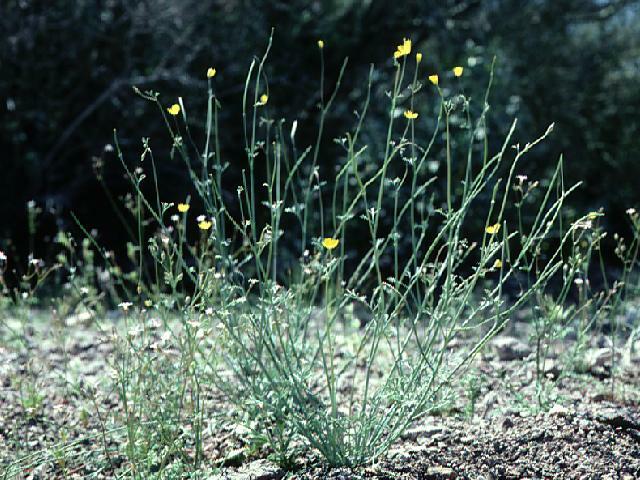 Subspecies twisselmannii is found only in the El Paso and Rand mountains of the western Mojave Desert. Subspecies covillei is more widespread across the northern Mojave, and ssp. 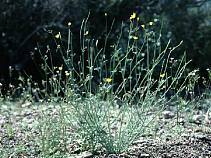 minutiflora extends north into the Great Basin, south to Baja California Sur and Sonora, and east to Arizona. PLANT annual, 0.5-3.5 dm tall, erect or spreading, glaucous. LEAVES basal and cauline, terminal divisions obtuse. INFLORESCENCE cymose or solitary. 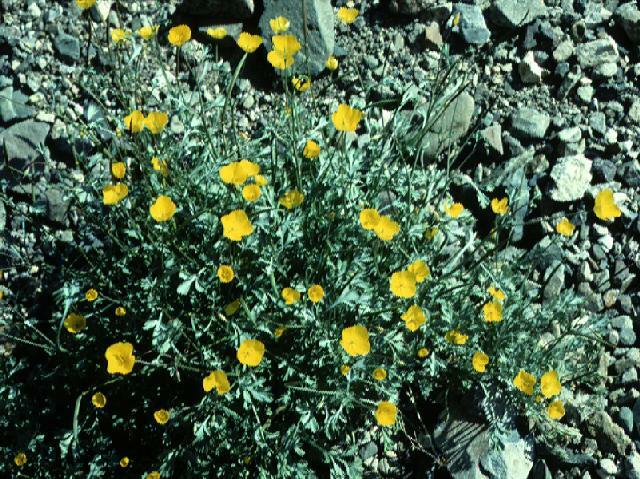 FLOWERS nodding in bud; receptacle conic; calyx short-pointed, glaucous or glabrous; petals 0.3-2.6 cm long, yellow, sometimes with orange spot at base. FRUITS 3-6 cm long. SEEDS 1-1.4 mm diam, ellipsoidal, reticulate, brown to black. Desert washes, flats, and slopes; 0-2000 m. DSon, DMoj, SNE; w AZ, s NV, sw UT, nw Mex. The typical form is hexaploid (2n=36), with petals 0.3-1.0 cm long. The tetraploid (2n=24) of c and n DMoj with petals 0.6-1.8 cm long is subsp. covillei (E. Greene) C. Clark. The diploid (2n=12), rare in the El Paso and Rand Mtns of extreme w DMoj with petals 1.0-2.6 cm long is subsp. twisselmannii C. Clark & Faull. This page Copyright © 2000 by Curtis Clark. Last revision Tuesday, July 4, 2000. Images are free for personal or educational use; for all other uses, please see the licensing agreement. Space for this page is provided by California State Polytechnic University, Pomona. Although it is intended to further the educational mission of the University, the opinions expressed here are those of Curtis Clark, and do not represent official policy of the University.